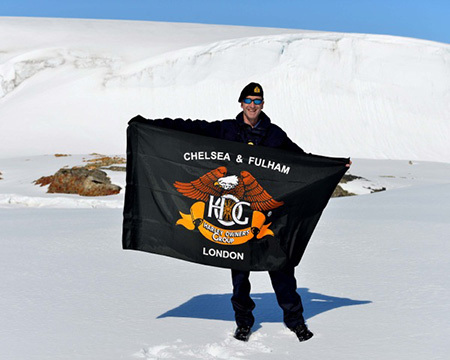 Chelsea & Fulham in Antarctica sets furthest south record for a Chapter Flag? 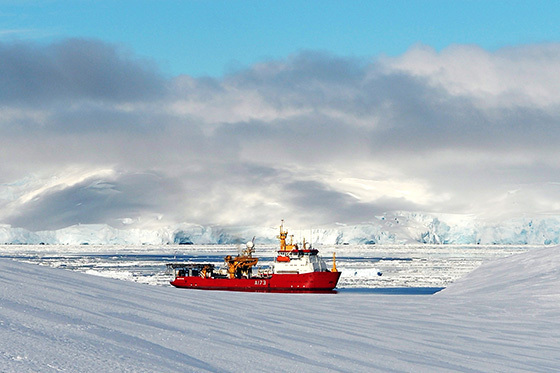 Rhett Hatcher and Liam Daubney are currently both serving in HMS Protector, the Royal Navy’s Ice Patrol Ship, and deployed with the Ship in October last year. They have travelled via Cape Verde, Rio de Janeiro, Montevideo and Punta Arenas, for regional engagement visits, followed by varied tasking around South Georgia. After that, the Ship transited across the infamous Southern Ocean and, Drake Passage in particular, to arrive in Antarctica via the peninsula at the beginning of the Austral summer. When at home in the Northern hemisphere, Rhett rides a 2004 Fatboy and is a member of the Warr’s Kings Road, Chelsea & Fulham Chapter while Liam (he is the one with the beard) rides a Sports Custom XL 1200 CB as a member of the Lincoln, Lindum Colonia Chapter. 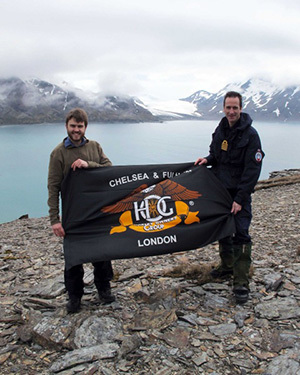 When Rhett mentioned the deployment and some of the amazing places he would get to visit in Antarctica, John Warr and the team on the Kings Road were immediately willing to entrust their Chapter flag into his care in order that it might be unfurled and recorded as a challenger for the ‘Furthest South’. HMS Protector, on a ‘double deployment’ set to return to the UK in 2015, is tasked with providing a UK Sovereign presence in the British Antarctic Territory, South Georgia & South Sandwich Islands and surrounding maritime areas, underpining their security and good governance; and meet the UK treaty obligations and exercise rights under the Antarctic Treaty system through inspections, hydrographic charting and support to scientific research. Whilst the Ship is deployed, the Ship’s Company are able to take short periods of leave and Rhett and Liam very much look forward to taking the covers off their bikes and doing some miles with their Chapter friends whenever possible. In the meantime, the pair, along with other HMS Protector bikers are crafting a plan to hire H-Ds on the east coast of the USA during a planned maintenance period when the Ship is not able to be on patrol during the Antarctic winter.